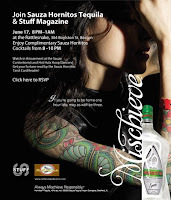 Stuff Magazine has another event coming up tomorrow night (Wednesday 6/17) and if you're a tequila drinker (Sauza in particular) this one's for you. Watch in Amazement at the Sauza Contortionist and Hot Hula Hoop Dancers! Get your fortune read by the Sauza Hornitos Tarot Card Reader! You're probably thinking the same thing that I am - two hours of free tequila cocktails is just what I need this week. It'll be hump day afterall. Be sure to RSVP if you want to go, because they're usually pretty strict about being on the list. It's been a while since I've had Sauza - nowadays it's mostly Patron for me. But when it's free, I'm not gonna complain. 0 Response to "Sauza Cocktails at the Rattlesnake - 6/17"